Our adventure to Mount Kenya took us from the relative comfort and ordered chaos of Nairobi to the slopes of Kĩrĩ Nyaga (Kirinyaga), as the mountain is known to the Kikuyu people. The 17,057 feet tall mountain is Africa‘s second highest mountain after Mount Kilimanjaro (19,340 feet). We were the three amigos (Blake, Aaron and I) full of youth and enthusiasm, with illusions of conquering a mountain. Notions we would later understand were but mere delusions whispered to us by our egos. From downtown Nairobi the 3-hour, 175 km journey took us from the expansive plains of the Nyika plateau through Thika, a town aptly referred to as Kenya’s Birmingham. We had a brief rest stop at Mwea, with its picturesque rice fields that resemble an endless emerald sea. Our journey’s end was Chogoria, a town nestled in the lush foothills of Mt. Kenya’s eastern slopes. An Eden of sprawling farmland interspersed with patches of evergreen forests, crisscrossed by gushing mountain streams and rivers. We were to meet John Abbas at babu’s farm, where we would be spending the night. This was the perfect opportunity to see the countryside, meet up with friends and take a dip in the chilly waters of the Uwinga falls on the enchanting North Maara River. The Ameru people are friendly and welcoming, they believe guests bring blessing and honor to the home. It’s because of this cultural belief and welcoming way of life that the guys offered to make a bonfire in readiness of the day’s dinner. We got some vegetables and two rabbits from the farms around us. The flame grilled rabbit with vegetable curry and fruit salad as dessert was washed down with eager sips of chang’aa, a local potent grain spirit that packs quit the punch. The rest of the night was spent with all present, including Abbas, hurdled around the bonfire chewing mouthfuls of miraa and engaging in animated conversation. We were in an upbeat mood, too excited to let sleep grasp us. It was a clear moonless night and the night sky was a fresco plastered with innumerable stars and the occasional shooting star hurtling across the firmament. Our spirits were willing but flesh is weak, we had to turn in for the night and we drifted of to sleep lulled by a symphony of cicadas, night owls and the sometimes-mysterious call of the resident bush baby. Roosters heralded news of the incoming dawn as the sun’s rays begun to tickle the snow-capped peaks of Mount Kenya. Morning was met with the territorial calls of birds and the different array of farm animals all holding concert, performing an ode to a new day being born. Breakfast consisted of grilled arrowroot, a cup of steaming hot milky tea and a bunch of sweet bananas. John showed a few hours later, he was to brief us on the itinerary of our oncoming trip up the mountain. 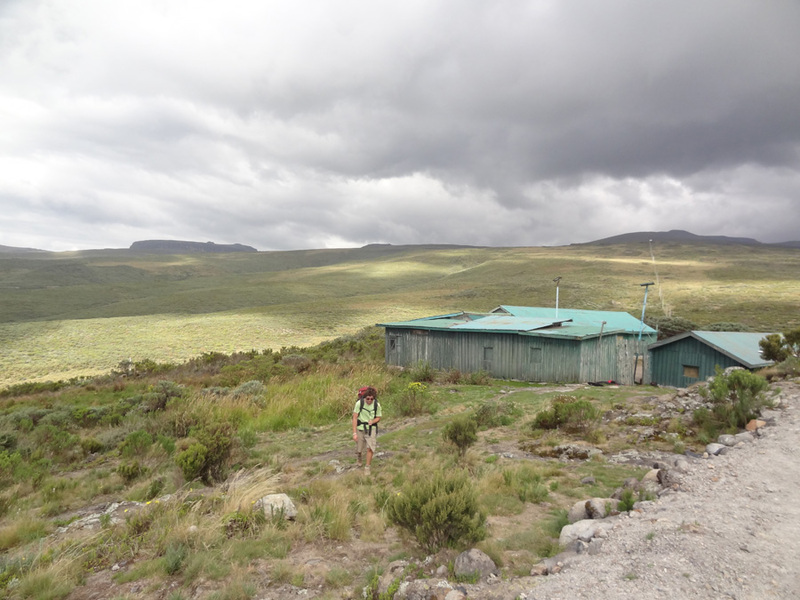 The plan was to leave for Meru town, where we would transfer to Timau and begin our ascent through the Sirimon route. An experience that cemented our love for the people around the mountain is one we had in one of the homesteads that line the road towards Mount Kenya National Park‘s gate. Having been overcome with thirst, we stopped at a compound to ask for water. An old lady, who seemed to be matriarch and surrounded by a myriad of small smiley-faced children, got up from where she was seated and rushed over. She hugged us, and welcomed us into her house singing songs of praise and swamping our bodies with warm motherly hugs. This took us aback, we didn’t expect such an open hearted and warm reception, and upon our inquiry we were informed that to them guests were water, and water was life. The children were now all around us; their faces coated with toothy grins. Infectious giggles filled the air, a little girl who told us her name was Nkatha rushed into the house and came out with a jug of milk tea and a handful of sweet bananas. We proceeded to have a hearty meal with this family that did not know us. This is one of the many moments on the trip that really left us with a complete sense of wonder and amazement. It’s an 18 km uphill trek from the tarmac to Old Moses, the first camp. As we rose five thousand feet, the sweeping vistas from the gate was of such remarkable beauty that we were compelled to take a short rest, have our lunch and soak up the panoramic view of Nanyuki town and its far-reaching savannah speckled with golden wheat fields and massive flower greenhouses. We had lunch in preparation for the remainder of the hike that would take us through the mountain rainforest, with majestic trees that looked almost as old as the hills we were walking through. The forest, with its thick umbrella canopy gave temporary respite from the bright African sun that was mercilessly showering us with its intense heat. A bushbuck and the occasional duicker could be briefly seen grazing before they took notice of strangers and scuttled into the safety of the obscure undergrowth. The rainforest melted into bamboo outgrowth, with the green sinewy shafts shooting out of the ground like contorted fingers reaching for the sky in what seemed to us like they were congregated in worship of the sun’s rays. The surrounding beauty was a pleasant distraction from the arduous uphill hike that was beginning to take its toll on us. The rapid shift towards a higher altitude served only to exacerbate the grueling ordeal. It was day one and the mountain was already making its mark on our psyche, challenging us, almost taunting us and establishing its dominance of us mere mortals. The words our mountain guide, John Abbas, had shared the night before started to sink in. 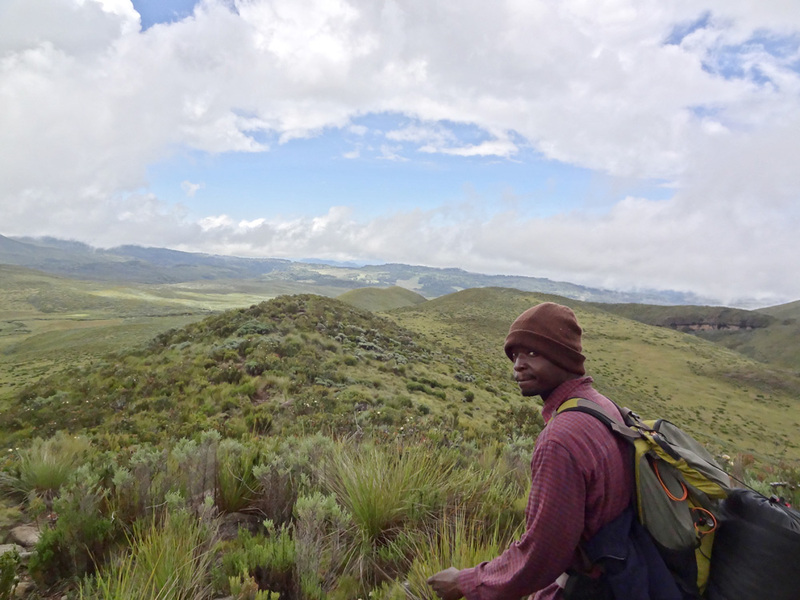 John is an amazing guide with a treasure trove of information on wildlife, history of the people who live around the mountain and geographical facts about the environment. After a punishing 8 hours of trudging up the side of the mountain we caught site of Old Moses base camp. It was a collection of corrugated iron sheet structures perched on the top a hillock that invoked thoughts of a hermit commune tucked away in the beauty of heath and moorland, away from the hustle, bustle and congested memories of city life. Continue reading part 2 of Man vs. Mountain. Would you like to share your Kenya travel story? Visit this page to submit.